Since practically the dawn of consumer television, Saturday mornings have meant sitting down in front of the TV with a soggy bowl of sugary cereal and watching cartoons. But in the age of multiple 24-7 kid-focused cable channels, the Saturday morning cartoon is now a relic of the past. Now, a pair of Twitch channels are teaming up to recreate Saturday morning fun times for the age of streaming. 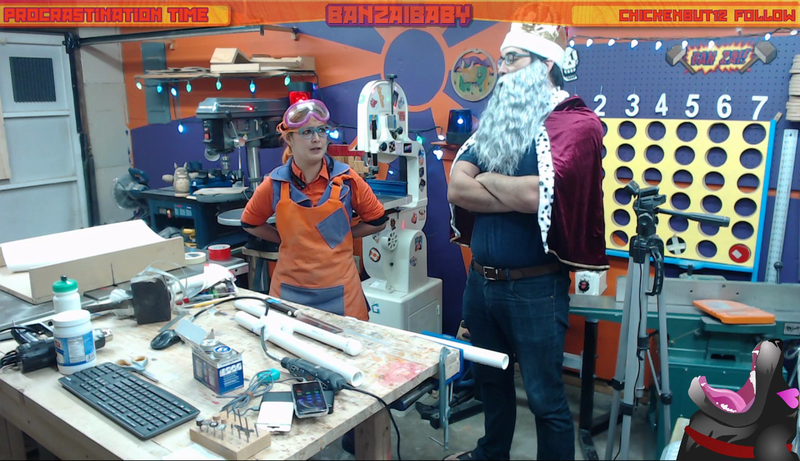 Super Funiverse, which began running every weekend at the start of January, is a team Twitch channel that currently runs two different kid-friendly streams: an arts and crafts woodshop known as BanzaiBaby, and an elaborate interactive puppet show called AdventuresOfEm. Both channels aspire to create entertainment that kids and adults can enjoy together, an idyllic island in Twitch’s vast sea of profanity-laden, often violent content. Every Saturday morning at 8 a.m. Pacific, you can tune in to watch both shows, as well as episodes of 1990s Sonic the Hedgehog cartoons. Antoinette Feore, who prefers to go by her stage name Banzai, spent six years as a daycare teacher before starting her Twitch channel in 2016. Last year, she and her husband James started Super Funiverse, after Banzai fell just short of victory in Twitch’s Stream On competition. For decades, Saturday morning cartoons were a weekly event, one that appealed to both kids flush with weekend free time and advertisers looking to reach those kids. For a handful of hours each morning, kids and sometimes even parents would gather ‘round the TV and watch shows like Scooby-Doo in the late ‘60s and early ‘70s, Transformers in the ‘80s, and everything from Captain Planet to Pokémon in the ‘90s. As a kid, I don’t remember ever being explicitly told about this. It was just something you did. This weekly ritual seeped into everything: trends and fads, what kids talked about, aspirations, social hierarchies, and so much more. In a world that was already beginning to combust into the endlessly complicated multimedia explosion that now constitutes our daily lives, Saturday morning cartoons in the ‘90s provided a brief, flickering focal point. However, the middle and end of the ‘90s saw Saturday morning cartoons die out thanks to the popularity of cable TV, with its ability to serve up kid-friendly entertainment at all hours on channels like Cartoon Network and Nickelodeon, and more stringent FCC broadcast standards that required more educational programming and less Street Sharks. How do you even begin to recreate that decades later, on a very different platform? Super Funiverse is trying to pull it off with a mix of old and new, using crowd interaction as the glue to hold it all together and make it feel fresh again. The block kicks off with The Adventures of Em, a story-driven, Muppets-inspired hour in which Twitch chat can interact with characters like a fuzzy bear creature and his talking robot backpack, and influence the decisions some characters make by voting at crucial moments. Then it shifts over to BanzaiBaby’s Workshop, which runs for three hours and alternates between experiments, projects, and episodes of the cartoon, Sonic Underground. Right before they sign off for the day at noon pacific, , both channels “raid” – that is, send their communities to visit – another family-friendly channel of their choosing, like a guy who teaches simplified versions of programming or a woman who creates her own coloring books. Twitch creators often collaborate, but Super Funiverse requires closer coordination than most. Adventures of Em, especially, is a Herculean production due to its reliance on scripts, costumes, a studio, and a fair amount of improv. Ross Gerbasi, one of the showrunners of Adventures Of Em, told Kotaku over the phone that logistical concerns were a big motivating factor in their decision to join Super Funiverse. On Twitch, people usually stream on fixed schedules for hours at a time, often multiple times per day. For a show on the scale of Adventures of Em, that wouldn’t have been feasible. While part of its appeal is interactivity that traditional television doesn’t allow for, it also needed something old-fashioned: a timeslot. After meeting Banzai at last year’s TwitchCon in San Jose, Gerbasi and the rest of the Adventures of Em team realised they’d found the solution to their problem, and signed on with Super Funiverse shortly after. 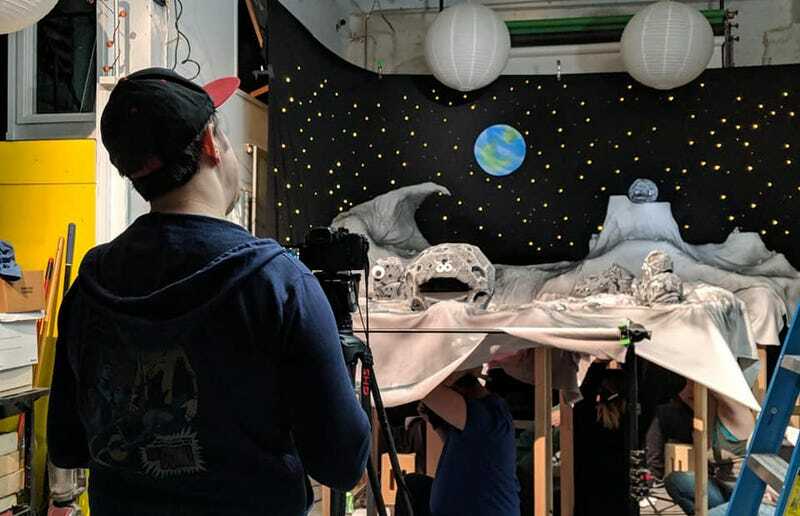 Around 20 people are responsible for making Adventures of Em happen on a weekly basis, 10 of whom are “creating the sets, building the puppets, the fabrication process – all of that,” Gerbasi said. For Twitch, it’s a large-scale production, but in the grand scheme of things like this, it’s a small team. “It is a complex thing that we’re doing, but it has to be smooshed down in a way that this team can handle it,” Gerbasi said, noting that just one person, for example, is in charge of both audio mixing and scene switching – two crucial aspects of production that would be handled by separate people on TV. The show is interactive in two ways: directly, and through voting. 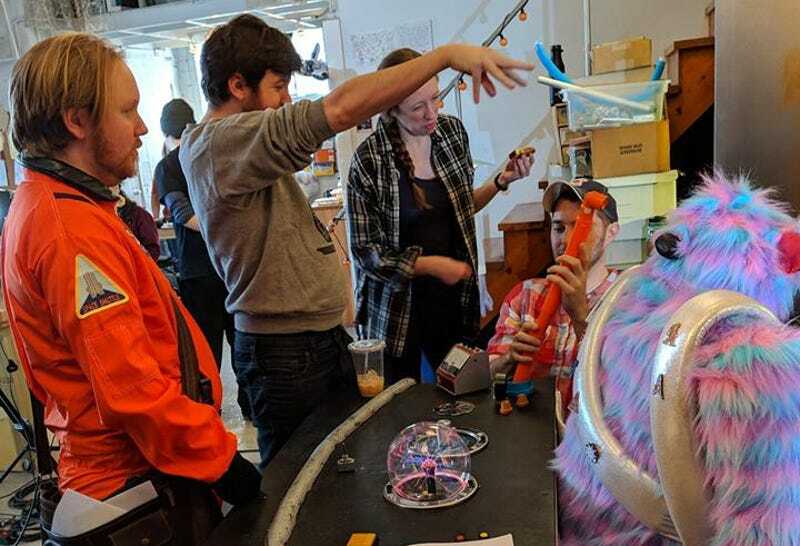 For the first 10 or 20 minutes of each session, Twitch chat can communicate with the three hosts: furry bear creature Bop, robot backpack snake Beep, and a “digital puppet” computer character named Sys Op. Even though the chat is heavily curated for reasons you might expect, the puppeteers have to do a lot of improv during this opening segment. A lot. After those opening moments, the show moves into a more scripted narrative with forking branches. This portion tells a series of stories about Em, an alien creature who travels through space with a magic (or “technically scientific,” as the show’s opening theme explains) harmonica. In the show’s first episode, Em helps a young human girl named Chloe who’s having trouble coping with the fact that she and her family are moving away from their old home. During the ensuing adventure, Em and Chloe go to a space station and try to help an astronaut collect moon rocks. Problem: the rocks are sentient and – as they explain in the form of a song – very stubborn about the idea of moving. Players then get to vote on how to persuade them to move. Players first voted to beam Twitch’s popular “Kappa” emote to the rocks, but while it made for a funny scene, the rocks only grew grouchier and more dedicated to their set-in-stone goal of not moving as a result. Chat then decided to tell the sternest moon rock that there was paper behind him, and that paper beats rock. That got him to turn around, see the stars above him, and meet another moon rock who’d been standing behind him for countless years. Gerbasi said this scene is just a herald of more ambitious things to come. “As we move on more and more, there’ll be more and more forks in the road, and more and more ways that the stories can change,” he said. The show’s interactive nature has also necessitated the creation of new roles behind the scenes, like an interaction coordinator, who uses Twitch extensions created by a company called Warp World to keep track of the audience and trigger events. Since no one can talk while the show is live, lets the mics pick up their voices, “a massive collection of monitors” on the set conveys information to the team. One shows everything the interaction coordinator chooses to send their way, whether that means specific cues or bits of audience banter for actors to work into improvised lines. Other monitors show what viewers are seeing, so actors (both humans and puppeteers) know when they’re live. Banzai is, by comparison, a more typical full-time streamer who makes a living off Twitch and broadcasts most days of the week. In her Saturday morning show BanzaiBaby’s Workshop, she creates kid-friendly projects: a wooden puzzle table, a replica of the Gadgetmobile from Inspector Gadget, a potato cannon. As a former professional toymaker, her goal is to be a “positive and friendly presence” who pushes the boundaries of what Twitch is about. “Even starting with my first streams, a kernel of the family show idea existed,” she said. Her first streams from 2016 saw her dressed up as an elf, making toys in an ersatz Santa’s Workshop. “It took a little while for the vision to refine from there, but after about a year-and-a-half, I was pretty set on the idea of making my stream one that entire families could enjoy together,” she said. On Saturdays, she adds actual cartoons to the mix. 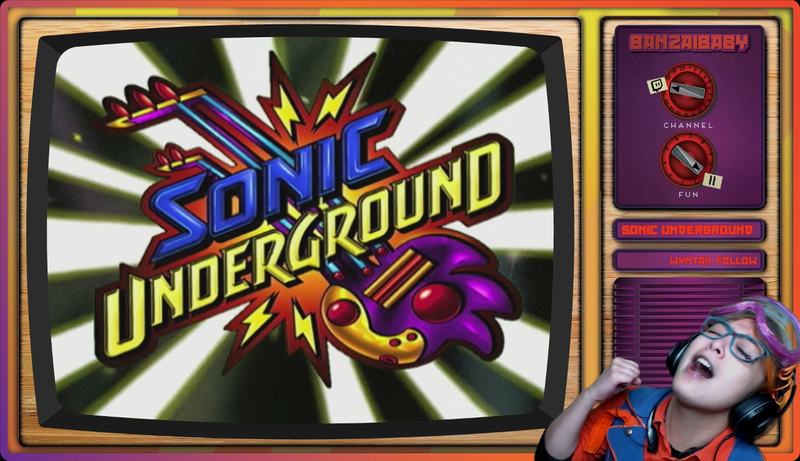 In between builds, she and her audience watch and comment on episodes of Sonic Underground, a show in which Sonic The Hedgehog and his brother and sister search for their mum in a post-apocalyptic landscape and are also in a band for some reason. 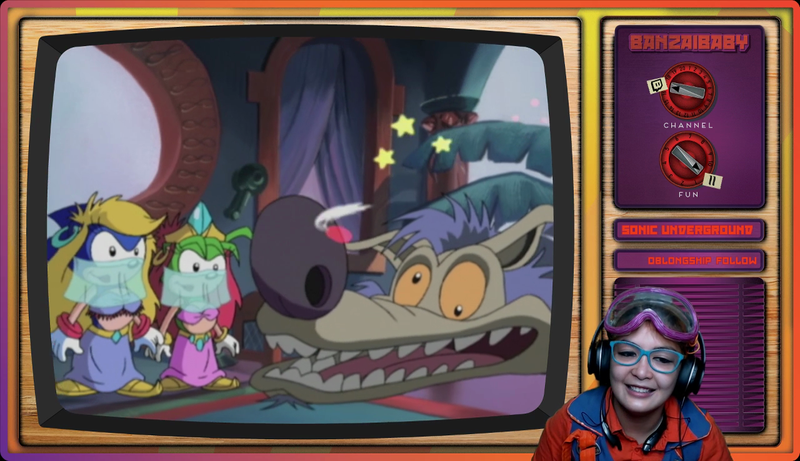 It’s an odd duck (or duck-coloured self-insert fan fic hedgehog) as far as Sonic cartoons go, but getting the rights to air it on Twitch still proved to be a challenge. Banzai’s husband James Feore, who handled most of the licensing, found out early on that just sorting out who owned the rights to popular video game-related shows was a “nightmare” in and of itself. And once he knew who to approach, the licensors were spooked by the interactive nature of Twitch. Feore was eventually able to strike a deal with DHX Media for Sonic Underground. “I still don’t think they still don’t fully understand everything and how it’s going to work, but the fact that they’ve been that open and that receptive has been really refreshing,” he said. Thanks to the visibility provided by Twitch’s Stream On contest, where streamers competed in various challenges for cash prizes, Banzai and Feore were able to visit Twitch’s headquarters in San Francisco recently and gain support for Super Funiverse in the form of front-page placement on Saturday mornings, which brings in thousands of viewers, as well as other types of marketing assistance. That’s given the block an early boost, but Feore doesn’t want to be reliant on that, hoping to “attract enough attention” that it doesn’t need special treatment to get watched. And maybe eve carve out space for others on Twitch to create similar family-friendly entertainment for those carefree Saturday mornings.